When I was first introduced to learning to play some jazz, it took more than a little while to understand what all the strange chords names meant, let alone play them. But having made a bit of progress with that, it’s nice to think you can join in with other people. 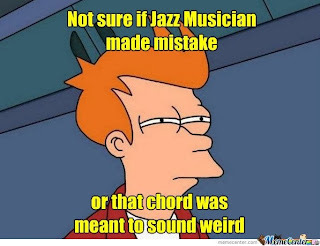 That’s when you learn that jazz people aren’t normal. For example, when jazzers talk about a chorus, they don’t mean the bit in between successive verses of a song. They’ll say things like “Take a solo over two choruses”. So what are you supposed to do? Keep quiet in the verse part and solo on the middle bits? 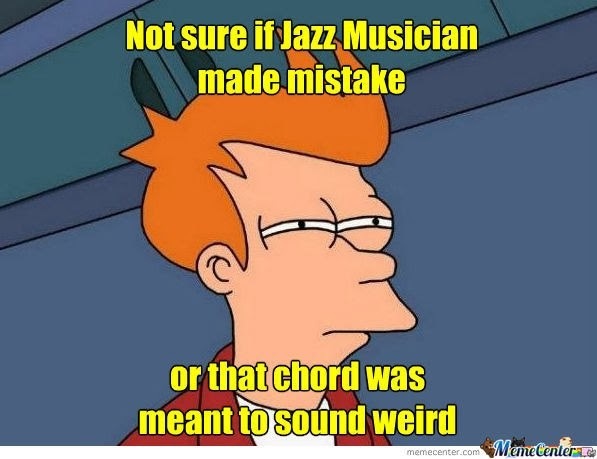 No, what jazzers mean by ‘chorus’ is the whole caboodle, the whole tune. Unlike normal folk, they talk about the A section, the B section and often several other letters. So a tune consists of maybe A, followed by another A, followed by B, followed by another A. So a tune has a ‘form’, such as AABA. You know, even the Beatles did this. You remember “Here, There and Everywhere”? It starts “To lead a better life, I need my love to be here.....” I bet they didn’t call it the verse though! Oh, and if you hear someone talking about a vamp, they mean a simple repeating chord sequence and they are not referring to our female vocalist. Usually. In fact they are indicating “go to the head”. The head is the beginning of the tune - so they are telling the band to stop soloing and play the tune from the beginning, for the last time. Maybe we should publish an ‘I Spy’ book....or Jazz Band Bingo. “This Sunday was a sell out; 60 covers as they say in the restaurant business and we were in pretty good form (considering the winged state of the rhythm section). We had a couple of very short intermissions to rest your correspondent ‘s left hand which had seized up late in the evening the night before, necessitating a substitute electric bass. I could feel it beginning to go on a couple of occasions but avoided melt down through resting for only a few minutes or using the guitar bass. Afterwards a delightful couple came to our dining room and congratulated us; Debs and Tess in particular as they knew them from childhood, having looked after them at their house many times. During dinner John was waxing oratorically and it then it struck me so I told the assembled company that with a few more heavy dinners in him he could pass for Winston Churchill... that did it... off he went into several impressions to the amusement of all.